You like art, don’t you? And you like space too? Then you’ll like this book by Anne Rooney. Yes, it’s Anne again. She can do books on so many subjects, and subjects in so many ways. This is astronomy again, looking at countless old images – art – showing us space. You could easily just look at these pictures, treating them like so much art. You probably already have, in many cases. 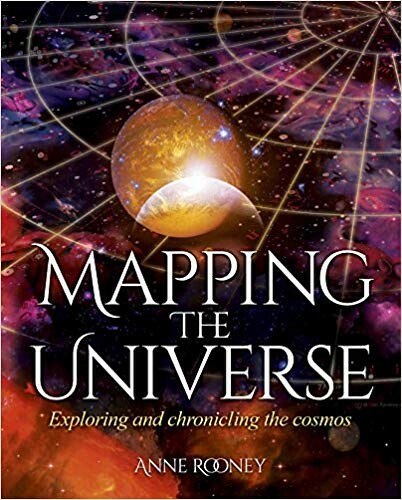 In Mapping the Universe Anne tells us a bit about the old men of science. You know, old Copernicus, Galileo, Kepler. Yes, I’m afraid it is mainly men. This fairly large book is full of old space art. It’s the kind of thing you can look at again and again. Cosmos for the coffee table. This is the book I’d have wanted as my course book in Astronomy at school. That is, if I’d been able to take Astronomy, which I wasn’t. In my day this was the subject of the last chapter of the Physics book, and we never got to it. I don’t actually know who the book is aimed at, except for the 14-year-old witch. 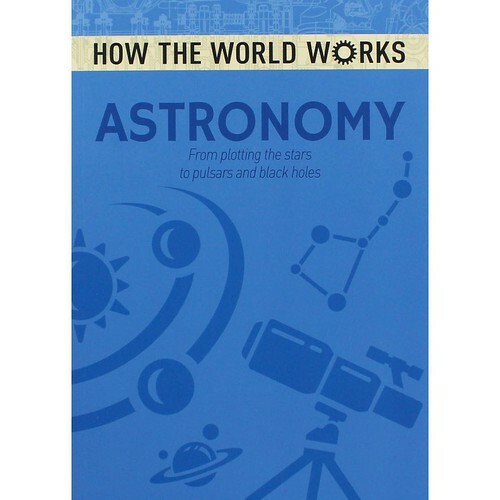 How The World Works – Astronomy, From plotting the stars to pulsars and black holes, by Anne Rooney, is an excellent book. It seems to do what that front page description suggests, and according to the Resident IT Consultant it could well cover 80% of the GCSE Astronomy course. That’s presumably why I am itching to read the book with a view to learning all of it, and then maybe sitting the exam. It’s mostly words, so we get descriptions of everything astronomical, from historical backgrounds to what we know now. There is [mostly] none of those scary equations or difficult diagrams and things that would have turned the young witch off. Well, not off so much, as just making it incomprehensible. Beautifully illustrated, this is simply a very attractive book. In fact, it’s quite goldilocks-ey in that it’s neither too much, nor too little. I like authors who can introduce a subject for those of us who’ll never be specialists, and make it seem quite normal. Towards the very end of its 200 pages there is a ‘recipe’ for how to find exoplanets. I discovered I sort of already knew most of that. While this strikes me as being most suitable for the secondary school student, I imagine that it can be more than readable for the really keen, and much younger, space nerd. If they’re interested, try it early, and before you know it you could have a little astrophysicist on your hands. I want to be Lucy Mangan. We are so alike in many ways, but I haven’t read all the books she has, nor can I write like she does. I want to [be able to] write like Lucy Mangan! I don’t expect that will happen. I also want to know what her house/library/bookshelves look like. I can’t conceive how you can keep that many books – in a findable way – in a normal house. Assuming she lives in a normal house. After reading Lucy’s Bookworm, I now love her parents, too. I especially feel I’ve got to know Mrs Mangan better – and that’s without the letter to the Guardian stating that the Mangans were happy to have their daughter adopted by some other Guardian letter writer. A friend of mine often mentions the fear induced in millions of people by the four minute warning so ‘popular’ in the 1980s. I’d almost forgotten about it, and never really worried all that much. Little Lucy was extremely concerned, but was reassured by her mother, who clearly knew what the child needed to hear. Basically, it would be in the news, so they would be prepared. They’d not send her to school if the end seemed imminent, and they would all die together at home. Problem solved. 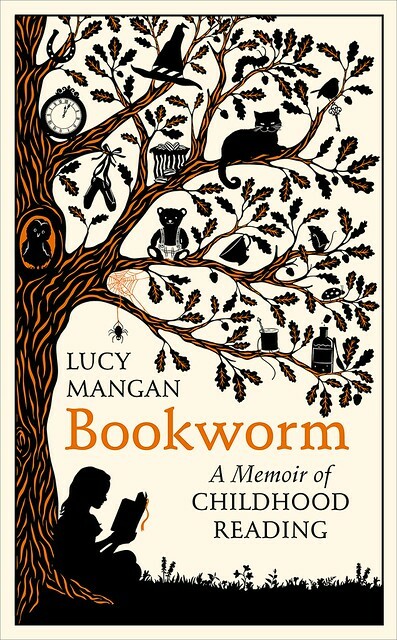 Bookworm is about what one bookworm has read – so far – in her life of loving children’s books. She is not repentant (I must try harder), and will keep reading what she wants, as well as keep not doing all those ghastly things other people like, if she doesn’t want to. That’s my kind of bookworm! This reading memoir is full of the same books we have all read, or decided not to read, as well as some real secret gems I’d never heard of and will need to look for. Lucy rereads books regularly, but doesn’t mention how she finds the time for all this. It’s been such a relief to discover that she dislikes some of the same books I’d never consider reading, and even more of a relief to understand how acceptable, and necessary this is. Lucy even has the right opinions on clothes. Very useful to know there are sensible women in this world. Growing up a generation – not to mention a North Sea – apart, we didn’t always read the same books. But by now we sort of meet in the here and now, and Lucy ends her book by listing a number of today’s must-read authors, and her judgement is almost completely spot on and correct. As we entered the Corner theatre at Sunday lunchtime, there was a creature sitting quietly in the corner (where else?) of the room. 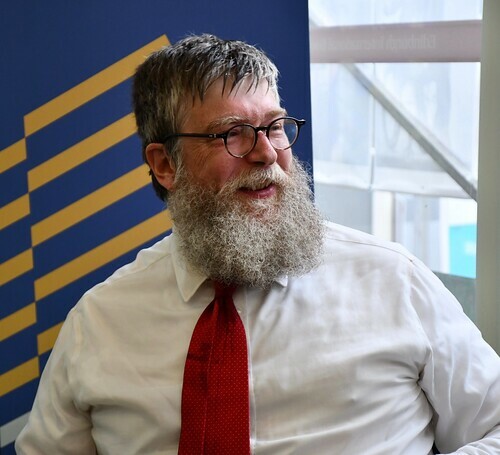 It was Philip Ardagh, pretending he wasn’t already there. Quite eerie. 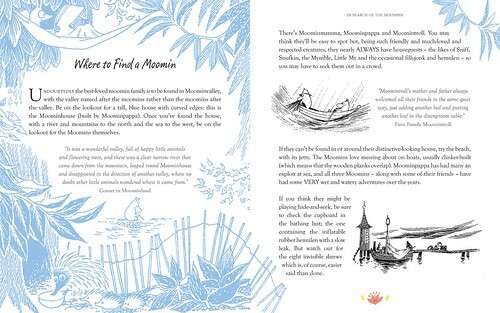 It seems there is more to Tove Jansson and the Moomins than the mugs. The young Philip liked going to the library. He also liked book tokens. In the library he discovered his first Moomin book, which was Comet in Moominland. (Snap.) Before long his collection of Moomin books had grown, later supplemented with some ‘nice to have, stolen property’ in the shape of a few early hardbacks, so battered and unwanted the library didn’t want to keep them. Philip is Sniff. (At least he didn’t say Little My!) There was some pondering on how – when you are not wearing clothes – you can have a pocket watch. Also, what’s the difference between a Snork and a Moomin? (Snorks can change colour.) 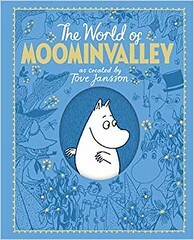 The Moomins have a different kind of ancestor to you and me; as their ancestors are still alive, coming out to live in their house when the rest of them hibernate. 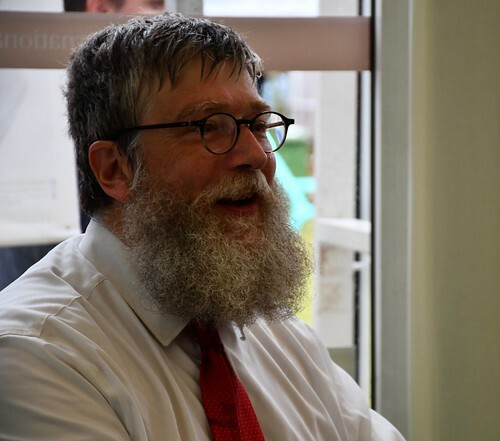 The audience was quite a knowledgeable one, meeting Philip’s standards regarding all things Moomin. There was one hairy moment discussing ‘girly pink’ but it was almost OK.
Another author in the yurt had informed Philip that ‘you’re exhausting.’ Something to do with his Sheldon-like fascination for certain things, maybe? ‘I’ve been sensational,’ he told us, when it was time to go. Or Journeys of Discovery, as it’s called. ‘What’s wrong with this book?’ ask the authors, Amanda Wood and Mike Jolley, at the beginning of the book. If I may, I’d say it’s too large. It’s large for me, and would be even larger for a child. But it’s fun. I used to adore finding mistakes in those Find Five Mistakes cartoons. Here you have a whole book full of mistakes! There are poodles, and dodos, and the odd Viking, just where you don’t want them. Or at least I think you don’t. 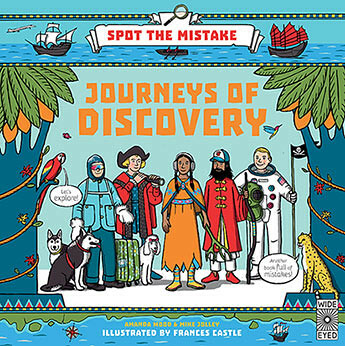 Look carefully at the illustrations by Frances Castle, and then read what Amanda and Mike have to say. You will learn a lot, and possibly end up cross-eyed with the strain of finding all the wrong floral suitcases at the South Pole. And all the rest. Adrienne Barman’s Plantopedia – A Celebration of Nature’s Greatest Show-Offs was a book I saw in abundance when I actually visited a bookshop last week. Two bookshops. I was glad to see it so prominently displayed. 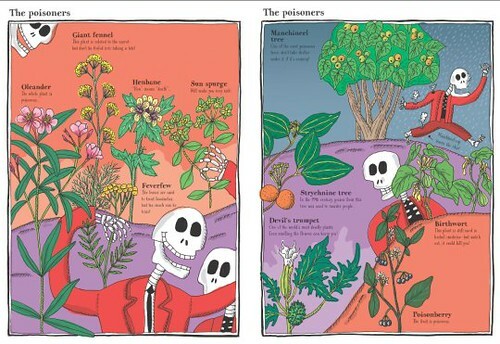 Each time I look at this book, I expect to se a serious reference book for children on plants. Well, it is, and it isn’t. Reference, yes. Serious, maybe less so. The table of contents have headings such as The confused fruits, The imposters, The prickly, The stinkers and The useful. Plus many, many more. It starts with air fresheners, of which I was given two last week. The illustrations are colourful and lopsided and very charming. Adrienne incorporates humans and animals, mostly quirky ones, in her plant pictures. This makes them fun to look at. I’m in there, with my cauldron. This is a new way of looking at plants. It’s not boring. In fact, no way am I giving this book away. Who’d not want 600 bold and bizarre plants in one book? I am a disgrace. I know very few star constellations, if by ‘know’ you mean that you definitely recognise them up in the sky, and remember every name for them, and can recall where you’d expect them in your part of the of sky. After reading this – mostly black – board book by Samantha Chagollan, with illustrations by Nila Aye, I could, perhaps, remedy that ignorance. I have had the sometimes outlandish shapes explained in the past, but here there is a drawing of say, Pegasus, and the stars marked in the picture of this celestial horse. I might still find Pisces a little farfetched, but Orion is always good. On the other hand, when it comes to stars I will forever get my dogs and my bears mixed up. 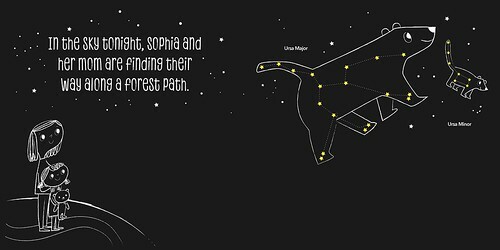 This is a book for a new generation of much cleverer stargazers.